I don’t really know what the Redland Tropical Trail is or how it was created. The trail is located in South Florida, about a four hour drive south of the Orlando area. In my next few posts, I will share my experiences in this area that most visitors to Central Florida don’t have the time to visit. Pity. There is some good stuff there. Despite the fact that I do my best to research every blog and provide as much factual information as I can in as entertaining a way as possible, I was unable to locate very much information about the trail. I did find that there is some dispute as to whether it is proper to refer to the area between Miami and the Keys in south Florida as the Redland or the Redlands. It also appears that the Redland Tropical Trail was some kind of marketing scheme created by nine businesses around two years ago. Not knowing for sure, I will give you my best guess based on what I observed. It appears that a small group of agribusiness tourist destinations got together to solve a problem. None of these places seem large enough to pull in vast amounts of tourists by themselves. Perhaps, however, if they band together for promotion and advertising purposes, they could attract some crowds. Mrs. LanceAround, our number one daughter and I accidentally stumbled upon the trail last January. We found it interesting enough to visit again this past month. According to their website, The Historic Redland Tropical Trail consists of nine businesses and a visitor’s center–The nine businesses are: R. F. Orchids, The Coral Castle, Everglades Alligator Farm, Schnebly Redland’s Winery, The Bonsai Garden, Robert is Here Fruit Stand, Monkey Jungle, Capri Restaurant and Cauley Square. We have only visited three of the nine: The Coral Castle, Robert is Here, and we had lunch at Capri Restaurant. They were all excellent. 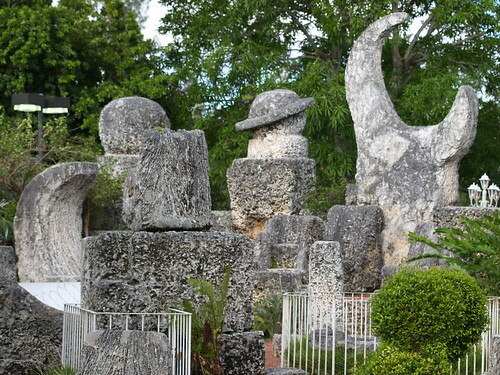 The Coral Castle is one of the most fascinating places I have ever experienced and I will feature it in it’s own post. The same with Robert is Here Fruit Stand. I won’t blog about The Capri Restaurant but I can tell you it was an oasis in the southern Florida landscape and we enjoyed an elegant Italian meal there. A definite thumbs up! Each of the three places we visited had an intricately carved wooden signpost (like the one above from the Robert is Here Fruit Stand)–Designed like an old fashioned roadside sign that has labeled arrows pointing to various destinations with the mileage to get there–Clearly designed by the Redland Tropical Trail. The signpost listed the names of the nine mini-attractions. In addition, at each location there was more advertising with the names of all the other members of the trail. As we traveled from place to place between the trail, the Keys and the Everglades, we encountered a very interesting roadside of South Florida. There were many farms and orchards with rows and rows of fresh growth. There were fruit stands, ice cream shops, depressed areas of boarded up homes and areas of obvious wealth. There was a house that was built to resemble a castle with round turrets and it was up for sale. (No, it was not the Coral Castle, I will blog about that later.) There were canals, obviously man made, with intricate drainage dams. Several businesses featured back swamp alligator air boat tours. There was even a large, presumably Indian, casino. In other words, there were plenty of interesting places to stop and explore. It would be nice if the Redland Trail website provided more information about their history, members and goals. For now, it is little more than a couple photos of each location with a link to their websites. Some of those individual websites, like the Coral Castle, appear to be in a perpetual “under construction” state for over a year. Even the main trail website was advertising an event from last February as I write this blog nine months later. So only time will tell if this coalition provides enough of a boost to these businesses to keep up the effort of maintaining the Historic Redland Tropical Trail. But for today, it got my family to visit a few places that we found highly recommendable. So for now all I can say is that it worked for us. I hope you enjoy it as well. This entry was posted on November 25, 2008 at 1:55 am and is filed under Local Info. You can follow any responses to this entry through the RSS 2.0 feed. You can leave a response, or trackback from your own site.